When the tidal coefficient is higher than 70, the Île Tatihou is accessible on foot via the bay of Saint-Vaast-la-Hougue, opposite it. This proximity between the two pieces of land makes them interconnected. Even stronger links have developed since their two Vauban watchtowers becaome a listed UNESCO World Heritage site in 2008. 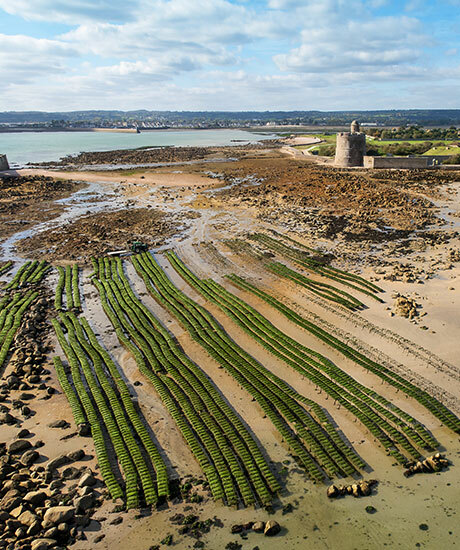 It is also Tatihou’s position in the bay of Saint-Vaast which makes the site so suited to oyster farming. In an area where marine currents are very powerful and the sea can be highly agitated, the island forms a natural rampart which tempers the impact of the elements, while supplying the oysters with waters which are rich in phytoplancton and nutrients, essential for their growth. This part of the north east of Cotentin owes part of its reputation to fishing, which has taken place here since time immemorial, but also the the market culture which developed since the mid 19th century. It is also the land of origin of the Normandy cattle, recognzied notably for its dairy qualities. What could be more natural, therefore, than oyster farming to develop in the heart of this land marked by iodine and silt, a hotspot for expertise in fishing, farming and gardening? As far back as the 17th century, fishermen farmed the natural oyster banks which existed on this part of the coast. From 1880, oyster farming began to take root and to develop, until it has now become one of the major activities of the region. 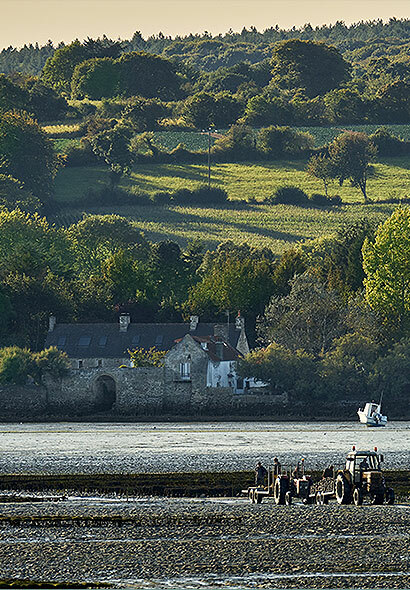 Beginning in the region of Saint-Vaast-la-Hougue, Normany oyster farming has gradually developed from west to east, along the Bay of Mont-Saint-Michel and the Nacre coastline. The Normandy coast is particularly suited to osyter farming. Thanks to its tides (the strongest in Europe), large swathes of the foreshore are exposed, making it possible to farm oysters offshore. They are raised in bags which are tethered to raised racks. These heavily agitated waters are rich in nutritional plankton. 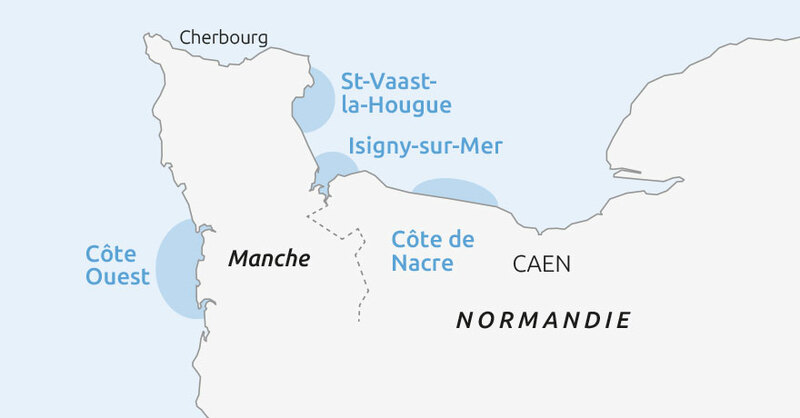 Normany is France's leading oyster producing region. The water quality of Saint-Vaast-la-Hougue has been certified as “excellent” by the ARS Normandie (the regional health agency). In addition to the State services, the water quality is constantly monitored and gauged by the oyster farmers themselves, true sentinels of the sea.